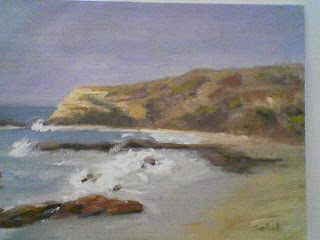 This painting was inspired by a great day at Jeff Horn's paintout, for the Laguna Plein Air Painters Association (LPAPA). We hiked down the trail to the shoreline, and set up our rigs, right along the break. One eye on the focal point, the other eye on that sneaky little shore break, that reclaims the sand with high tide. Jeff Horn is an all around great guy, and a truely inspiring artist and teacher.